In order to evaluate the quality of an artificial vision systems, for instance the quality of a motion detection system in a robot cell, the observability of the system can be analysed. During this procedure a closed expression of the quality function is established. However, the complexity of the analysis increases with multiple cameras, different types of sensors, image distortion, more sophisticated image analysis, and a more complicated computer vision algorithm (reconstruction, tracking, scene understanding, etc.). 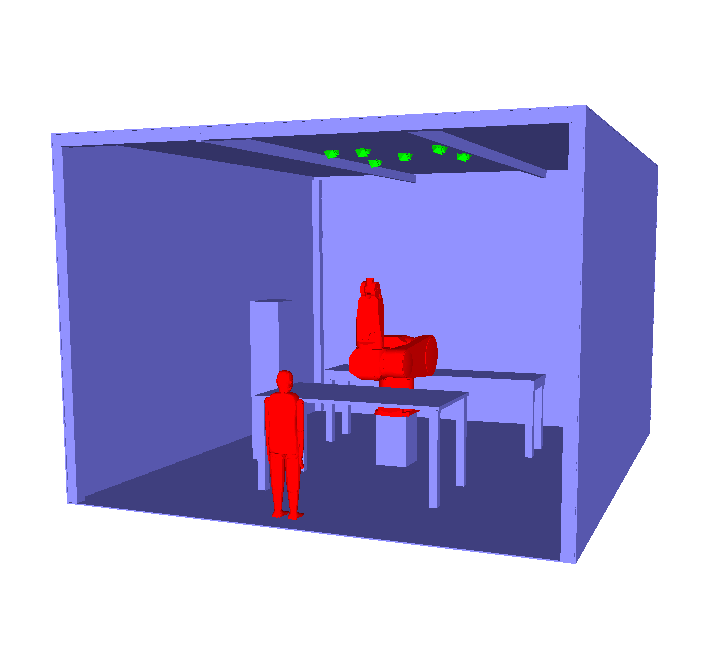 In this project, we estimate the quality of artificial vision systems by simulating the whole process computationally. Hereby, multiple cameras or other sensors are deployed virtually in the CAD-model of the scene (right), their sensor data is synthesized, processed, and in the end, the processed data is used for reconstruction, tracking, scene understanding, and other methods. This approach is ideally suited to evaluate image distortion, advanced image analysis, and reconstruction or tracking errors of vision systems. Special thanks goes to Dr. S. Kuhn, J. Völkel, T. Werner, M. Reischl, and Prof. D. Henrich for their contributions and motivations. S. Kuhn and D. Henrich. Multi-view reconstruction of unknown objects in the presence of known occlusions. Technical report, Universität Bayreuth, Angewandte Informatik III (Robotik und Eingebettete Systeme), 2009.